Ben Murphy has always had the physical skills to be a dominant player every game. Now, he’s adding the intensity, the relentlessness and the compete level on a consistent basis to his big-time shot, physical presence and hockey instincts. The junior right wing has been one of Bowling Green’s best players since late November. He’s totaled four goals and three assists, and an on-ice rating plus-2 during the last eight games. Murphy has been a hard worker since joining the Falcons, but his compete level and intensity have become evident every day in practice during his recent success. The 6-foot, 200-pounder has ability to be an outstanding power forward. He has seven goals and seven assists in 22 games, and skates on the power play. BG coach Chris Bergeron said Murphy’s first effort on a play has always been good, but now he’s adding a second and a third effort, if he doesn’t win the initial battle. “If you can consider Ben Murphy a relentless player, he’s going to be successful because he shoots the puck too well, his offensive instincts are too good, and he’s too big,” Bergeron said. Murphy’s improvement of late is the result of a better routine — everything from his eating, studying and sleeping off the ice, to working hard and playing well every day in practice. “I’m just trying to put myself in the best position to be successful,” Murphy said. Six of Murphy’s seven goals have come in Western Collegiate Hockey Association games. He also has four assists and two power-play goals in 14 league games. “He’s been focused,” Bergeron said. “He’s been receptive to coaching. He’s listened. He’s trying to execute that on a daily basis. We expect that from him every day in practice. Murphy has the chance to be a dominant power forward because of his skill, size and strength. He scored what Bergeron called a “total package play” when he assisted on a goal by Brandon Hawkins’ in BG’s 4-1 win at Robert Morris Jan. 4. “He ran over a defenseman and then made a nice pass to Hawkins,” Bergeron said. 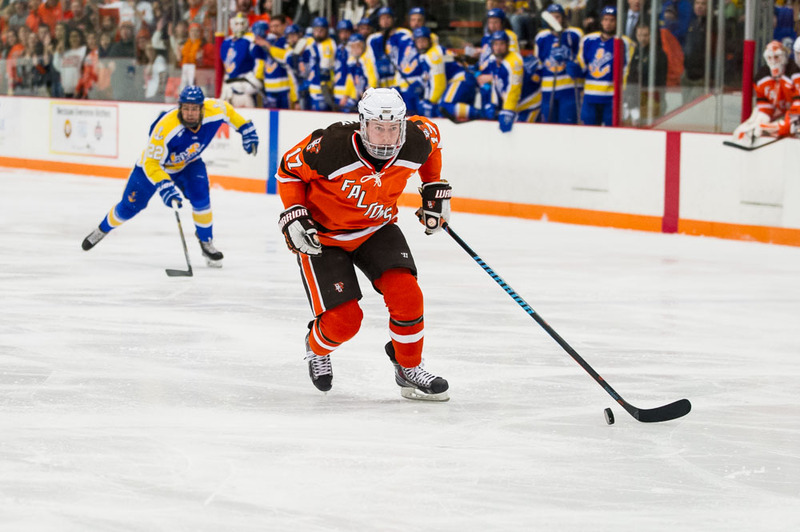 And Murphy’s hard shot enabled him to score twice in the final minute Jan. 10 to give the Falcons a 4-4 tie against the University of Alaska (Fairbanks). The Falcons expected Murphy to be an impact scorer after he totaled 31 goals and 32 assists in 44 games for the Carleton Place Canadians in the Central (Ontario) Junior Hockey League during the 2011-12 season. The native of Duxbury, Mass. had six goals and seven assists in 40 games as a freshman, and raised his totals to 13 goals and eight assists in 38 games last season. Next for Murphy and the Falcons, ranked sixth-nationally, are home games Friday and Saturday nights against Lake Superior at 7:07. BG is 14-4-4 overall and 10-2-2 in the league. Lake Superior, tied for last place in the league, is 6-19-1, 5-13.